How do I get from Anchorage to Whittier? Whittier is 60 miles south of the city by car, motorcoach, shuttle or train. Here are driving directions from Anchorage to Whittier. It is one of the Anchorage area&apos;s two major cruise ports. Princess Cruise Lines ships use Whittier as the starting or ending port (other lines use Seward). How far is it from Anchorage to Whittier? It&apos;s just over 60 miles between downtown Anchorage and Whittier, take the Seward Highway (Highway 1 on some maps) south, and look for signs for Whittier just past Portage. How can I get from Anchorage to Whittier? Anchorage is connected to Whittier by road and rail. Motor coaches from Park Connection connect Whittier to Anchorage on cruise ship days. There are many companies offering cruise ship transfers from Whittier. Taxis, Uber and Lyft also pick up in Anchorage. 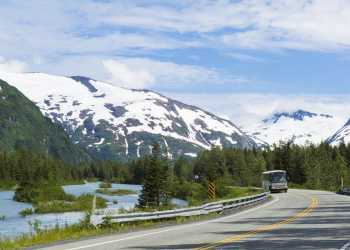 The Alaska Railroad&apos;s Glacier Discovery train has daily summer service between the Anchorage and Whittier, and many Princess Cruises itineraries include special rail charters as transfers for passengers. How long does it take to get from Anchorage to Whittier? It takes just over an hour by car or bus to reach Whittier, including a two mile trip through a mountain tunnel. The tunnel is a single lane, with vehicle traffic alternating between each direction every half hour. The train takes a little longer to make the trip, just under two hours. What can I see and do between Anchorage and Whittier? The trip south is one of the most scenic in Alaska, with the waters of Turnagain Arm on one side and the Chugach Mountains on the other. There are many small turnouts along the way that are photo-perfect. The small community of Girdwood is a great spot to take a quick hike or a ride up the aerial tram. The Alaska Wildlife Conservation Center is a great spot to get a close look at bison, moose, bears and other Alaska animals in a natural setting. Whittier itself offers fishing, and wildlife and glacier day cruises on top of being a major port of call for cruise passengers.